To blow you the breeze of healing and recovery. Is that what happens to someone who run out of inspiration? so you could find your inspiration. Listen to the doctor so you’ll heal fast. and release him out of his illness. I don’t want to see him sick. because of your intense zeal and glee. You’re just recharging. Be fully-charged soon! I feel so alive when I am with you. about those times that we’re happy together. smiling face of yours. Get well soon, hun. Relax, stay put and rest. I am praying for your fast recovery. Hey buddy, I know you’re stronger than your sickness. You can fight it. I’m wishing for your fast recovery. speedy recovery and soon see your smiling face again. I’m praying to God to keep you safe and sound. I’ll be right there to cheer you up. 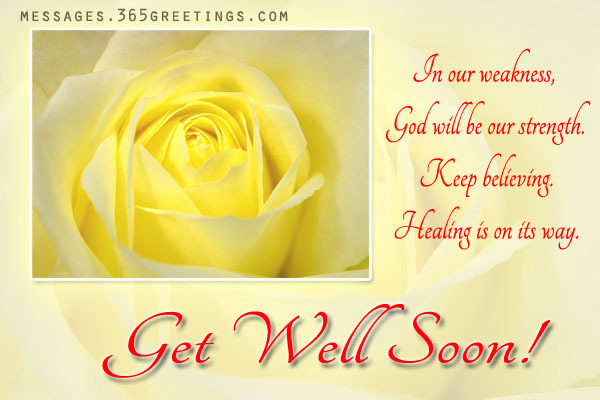 Hope you to get well soon. I wish for your speedy recovery. Here is a list of get well wishes and messages to help you get your creative juices flowing when you have a loved one feeling under the weather and are not sure what to write them in their time of need. These get well wishes can cheer them up during their time of sickness. I miss you a lot and hope you feel better soon. I think that I have come down with something, too. I am sick of you being sick! I don’t think that get well soon is good enough. I wish that you would get well now. because we don’t have your amazing help here at work. We wish that you have a speedy and full recovery! Being the hospital is no fun at all. I hope that you are out of there in no time. And is praying that you get better soon. I just wanted you to know that I am here for you always. that someone cares about you helps the healing process. Well, if that is the case then you should be feeling better already. and will drop everything to help you. I hate to hear that you are sick. I hope that you have a healthy recovery! to make you better and stay that way. Please let me know if there is anything that I can do for you. and I hope that you have a speedy recovery! I know being sick is awful. put some smile on your face. 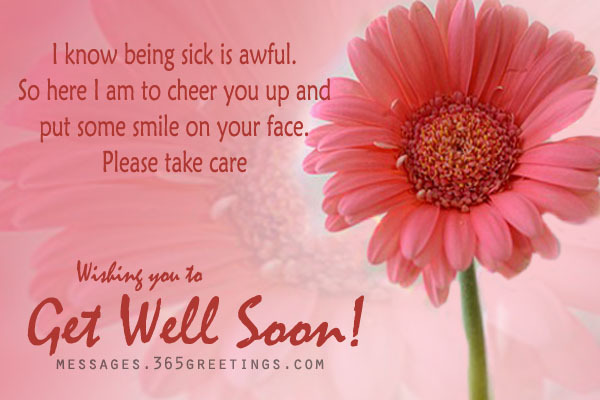 Please take care and get well soon. without sunshine. Put back the happiness soon. We miss you. Get well soon. May God heal your sickness fast. Sending our warmest get well wishes to your way. for sometimes forgetting to pray for Him. Renew your faith and glorify Him for healing. God is our Creator. He knows when we stumble. during the time when we needed it most. He didn’t let you be sick if He knows you cannot get over it. You are strong yet He wanted you to be stronger for Him. because of the illness that you have right now. Just imagine how much Jesus Christ suffered for us. Open a Bible and pray. God’s words are enough to make us feel better. Think of all the people who are sick now. Be glad that God gave you time to relax and rest. What is common among the people who are sick? They constantly pray for healing and God’s grace. Why you have to be sick? It’s awful to see you sick. Coz I miss you already. These get well soon wishes can lift your friend’s spirit while they are feeling unwell. These inspirational wishes will surely cheer them up and help them to recover fast. 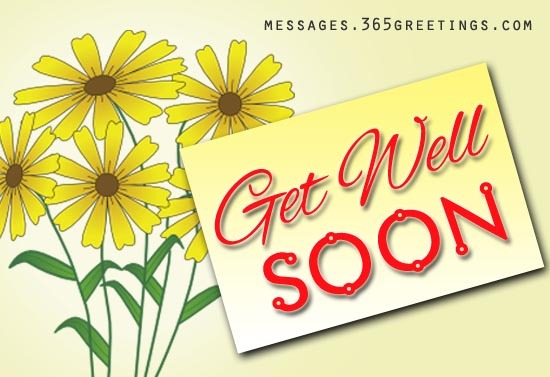 Feel free to share these get well soon wishes to your friends and family on facebook or twitter and via SMS, text messaging or email. My day lacked the soul that it had when you are with me. I hope you’ll get well soon. I miss you! I have a lot of story to tell but you are sick. I am praying for your speedy recovery. The sun does not shine as bright today as when you are with me. Hoping for your fast recovery. Without you, I’m like a paralyzed man. I wish you’re sickness will go away as soon as possible. I am stronger when I’m with you. Get well soon! so please hurry up and get well soon. Our day isn’t the same without you. We missed your comical statements and gestures. you told me laughter is the best medicine and you cracked up a joke. Then I got more ill. So I’m gonna get back to you. Kidding! Get well soon, chum! you haven’t stayed outdoors for quite a while. Just kidding! Get well and see you soon. You eventually spread happiness in no time. for the past few days because of your absence. Get well! so I can send mine to you! Get well soon. You are a tough man; tougher than any illness. I know you will be well soon. so don’t forget to seek for healing from Him. Get well soon! because they are too tired. Get well! from sickness is such a painful thought. Praying for your recovery, sweetie. 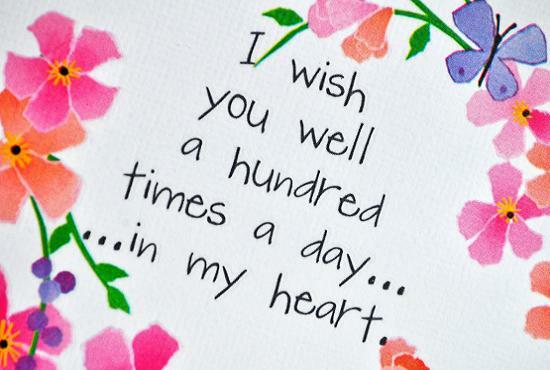 Show that you care by sending out these get wishes for cards to a person who is not in good shape. Use inspirational quotes and words to heal the pain that he is feeling at present. 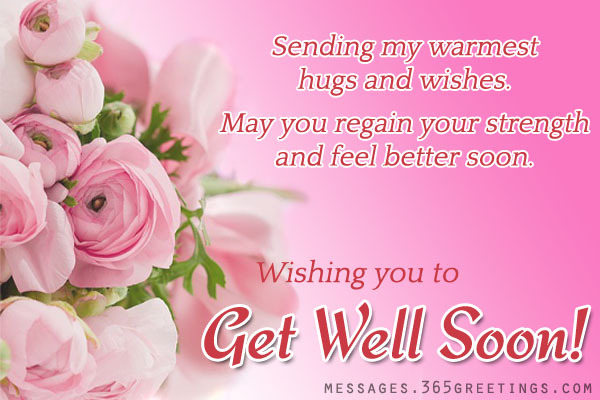 Here are some samples of get well wishes messages and get well soon SMS you can use. Being ill is worst if you haven’t got friends and family to comfort you. I am praying that God will heal you. I hope you will be back to your health soon! Wishing you a healthy and speedy recovery! and take time to rest. You have been working so hard lately. Now that you are sick, take time to gather your energy and be at your best again! and pampered by the people they love. Oh, I love to be sick also! that you need so that you will feel well soon! I miss spending tiring days with you! Please get back into shape soon! we will run miles and miles towards our goal! Get well soon or I will eat all of your chocolates. You are reminded to stop for a while and let your body rest. We are God’s temple that must be taken cared of. That is why you there lying in the hospital bed. Let me kiss you so that you will get better immediately. Sleep is the best rest that we can do to relax our senses. Forget worries so that you will not be stressed. 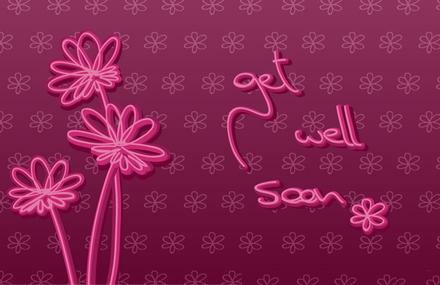 I am hoping that you will be better soon! I promise I won’t ask for anything more. Just be okay and free from illness. I promise that from now on, I will take good care of you. I hate seeing you ill. It makes me feel so sad. I wish I am the one who is there lying in the hospital bed. I hate to see you suffer with so much pain. Do not question why God allowed you to be sick. And continue to have faith in Him. Celebrate the goodness of the Lord. You are sick yet you still breathe. Keep your faith strong and feel the Healing Powers of our Father. Put in mind that you are not alone in your suffering. Pray that you will be healed soon. All it takes is a positive mind. Remove all the anger and hatred in your heart. You will feel better and lighter if you do. Do not blame God if you are sick now. Examine yourself and look at the positive side of it. Illness is not always physical. It can be mental, emotional, and spiritual. Be healthy in all aspects of being a human. When you are sick and is employing His hands for healing. Let Him live in your heart so that you will stay healthy and happy all the time.